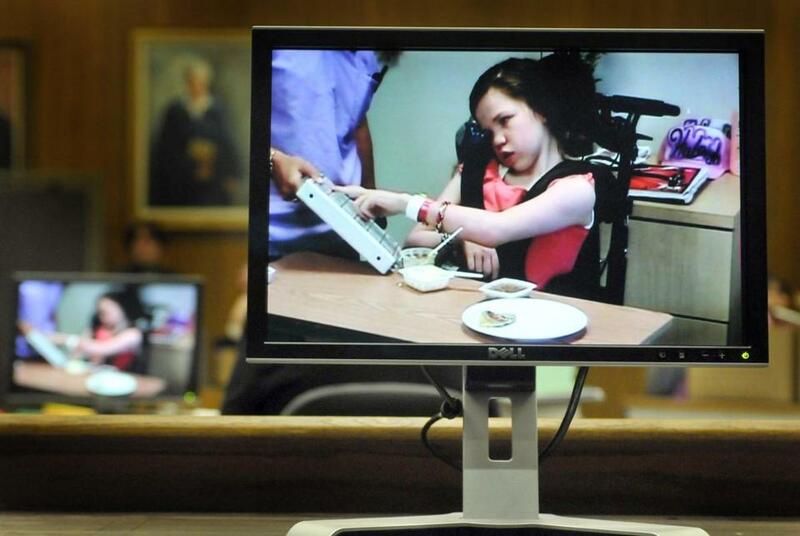 14-year-old Haleigh Poutre was shown on a monitor during the trial of Jason Strickland. The case of Haleigh Poutre raised major questions about how Massachusetts handled complex child-welfare cases. Her example would ultimately lead to statewide reforms, but not before the young girl suffered grave injuries that left her on the verge of being removed from life support. Below are some key moments in the Poutre’s case. Feb. 24, 1994 - Haleigh was born to Allison Avrett, a troubled single teenager. She would spend time now and then with her maternal aunt, then known as Holli Poutre. She had no relationship with her biological father. July 1998 - The aunt told state social workers that 4-year-old Haleigh was being neglected and had disclosed being sexually abused by her mother’s boyfriend. This set in motion a series of decisions by the state to give the aunt temporary custody of Haleigh. Sept. 2001 - Holli Poutre married Jason Strickland. They would live in a Westfield home with three children. September 2002 - The state’s child-protection bureau began receiving what would amount to more than a dozen anonymous complaints about Haleigh’s bruises and unkempt appearance. But the agency — then known as the Department of Social Services — found no basis for the complaints against Holli or Jason Strickland. Officials accepted Holli’s explanation that Haleigh has a self-injurious behavioral disorder due to her past psychological trauma. Sept. 11, 2005 - The Stricklands brought Haleigh, 11, to the emergency room of a Westfield hospital. She was in a coma, and had brain injuries consistent with being a high-speed car crash. Officials began a review of Haleigh’s entire case file. Sept. 19, 2005 - The state sought a court order authorizing removal of Haleigh’s life support, which included a ventilator and feeding tube. 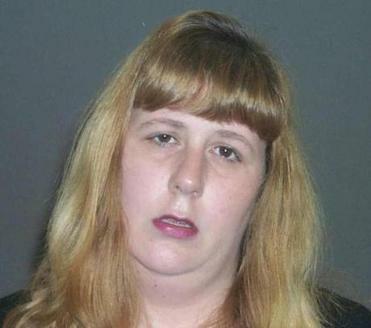 A police booking photograph shows Holli A. Strickland. Sept. 20, 2005 - Police arrested Holli and Jason Strickland on assault charges. Sept. 22, 2005 - Holli went to her grandmother’s apartment in West Springfield, where they both died of gunshot wounds in a murder-suicide. Sept. 26, 2005 - Jason Strickland, the stepfather, filed a legal motion to be Haleigh’s “de facto” parent, and as such, gain legal power to try to stop the removal of Haleigh’s life support. At this point, he alone faced the assault charges. If Haleigh died, he could potentially have been held responsible. The stepfather did not prevail at a lower court level, and ultimately appealed to the state’s highest court. A Springfield attorney took the case, pro bono, saying he was motivated not to save Strickland from a murder charge, but to give Haleigh a chance to recover. Sept. 30, 2005 - At a hearing, two doctors from Bay State Medical Center in Springfield gave Haleigh a bleak prognosis, saying she had irreparable brain damage no chance for a meaningful life. She was deemed to be in an irreversible vegetative state. Jan. 18, 2006 - The state reported for the first time that Haleigh was showing increased alertness in the hospital. Officials suspended efforts to remove her life support. July 2008 - The state passed sweeping child-welfare reform measures to address some issues raised by Haleigh’s case, including the need for medical input from at least two different institutions before making decisions in end-of-life cases. The new law also called for the name of the agency to change from the Department of Social Services to the Department of Children and Families. November 2008 - Jason Strickland was found guilty of playing a role in Haleigh’s injuries, including not protecting her from the assaults of his late wife. He was sentenced to 12 to 15 years. 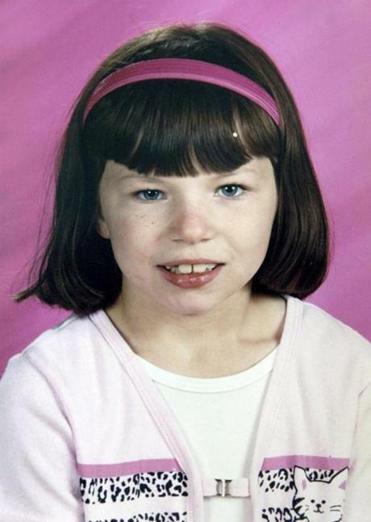 Dec. 18, 2008 - Haleigh, who had been recovering at a Brighton rehabilitation hospital, was released to live temporarily as a foster child with the Arnett family in Southwick. Sept. 30, 2010 - Haleigh, at age 16, was adopted by Keith and Becky Arnett who also have three sons. Haleigh attended a special education program at the Southwick public schools. 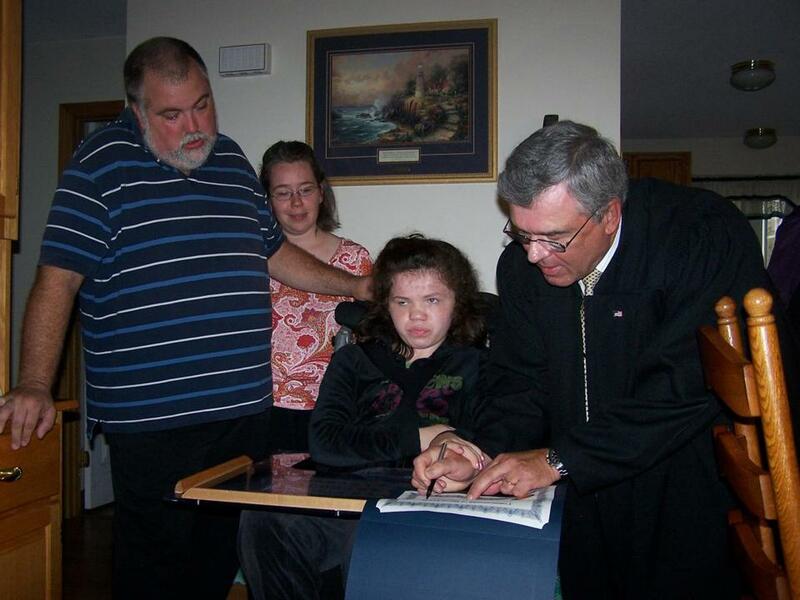 Haleigh Poutre's adoption ceremony took place at home.